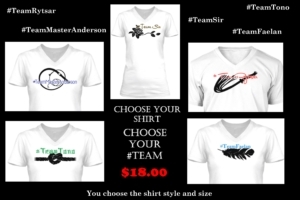 Which #Team are you on??? State your claim with pride for your favorite Dom with a T-shirt. Prices slashed for quick sale. You have until Sunday the 11th to place your order. Unsure which Dom is right for you? Take this fun quiz!